Located roughly halfway between Hanoi and Ho Chi Minh City, Da Nang is quickly becoming one of the country’s unmissable destinations. Perhaps best known for its beautiful beaches, there’s more to the city than first meets the eye. If you’re planning a visit, be sure check out our top things to do in Da Nang before you pack your bags! Marble Mountains, Da Nang, Vietnam. Image Credit: Guerretto / CC by 2.0. 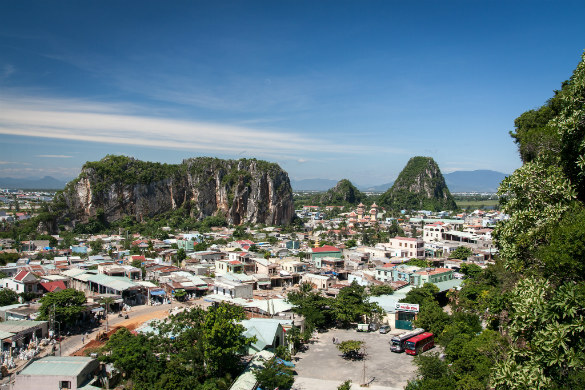 A cluster of five marble and limestone hills, the Marble Mountains are found around 9 km south of Da Nang. Surrounded by villages and picturesque scenery, the rocky outcrops are named after the five elements (water, wood, fire, metal and earth), and each offer plenty to see and discover. Home to caves, Buddhist and Hindu grottoes, intricate carvings and even a couple of pagodas, each of the hills is unique and incredibly intriguing. Be sure to stop by Thuy Son (water), where a stairway leads to its summit and panoramic views across the area. Spanning the waters of the River Han, Da Nang’s Dragon Bridge is quite unlike any other you’ll find in Vietnam. Measuring at 666 metres in length and accommodating six lanes of traffic, this modern bridge has been designed to resemble the shape of a dragon, complete with a giant head that breathes fire and sprays plumes of water. Every Saturday and Sunday night at 9pm, the bridge is closed and crowds gather to watch on as the dragon’s captivating show takes place. Illuminated by thousands of LEDs, the bridge is spectacular at any time of the day. My Khe Beach, Da Nang, Vietnam. Image Credit: Dragfyre / CC by SA 3.0. 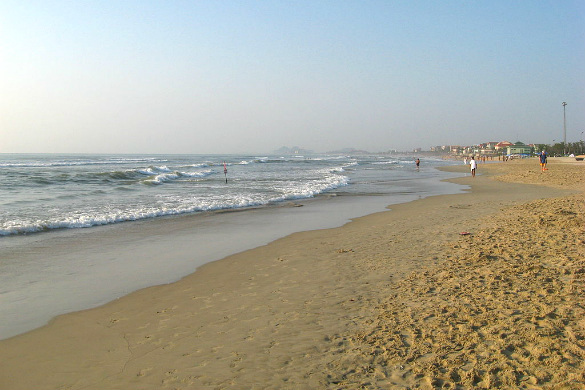 As a coastal city, it comes as no surprise that Da Nang is home to some fantastic beaches. 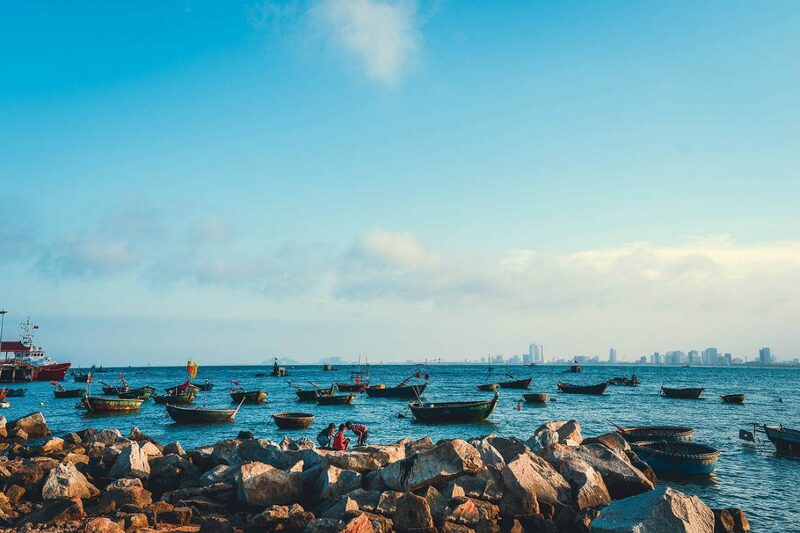 Great for swimming, surfing or simply lazing beneath the warm Vietnamese sun, local beaches, including Non Nuoc Beach and My Khe Beach, offer the perfect opportunity to discover a portion of the city’s 30 km coastline. Take a stroll along the soft white sands of Non Nuoc Beach or join a surfing or stand up paddleboarding lesson to learn how to ride waves like the pros. Stop by My Khe Beach for more great views and good swimming conditions, and find the perfect spot to sit back, relax and watch the waves roll in. The perfect place for a moment or two of peace and serenity, Da Nang’s Phap Lam Pagoda is home to some wonderful examples of Buddhist art, several huge statues and some beautifully manicured gardens. Built in 1934, the pagoda’s ground floor can comfortably accommodate a thousand people, while its top floor features spectacular carved pillars and other interesting decorations. Spend time exploring the grounds before heading beyond the pagoda’s gates for lunch. Visited by Buddhist adherents every day, the pagoda is surrounded by a number of fantastic vegetarian restaurants and food carts that are well worth trying out. Asia Park, Da Nang, Vietnam. Image Credit: Sun World Danang Wonders. Just a short drive from downtown Da Nang, Asia Park, an amusement and culture park otherwise known as Sun World Danang Wonders, offers plenty of great ways to while away the hours. 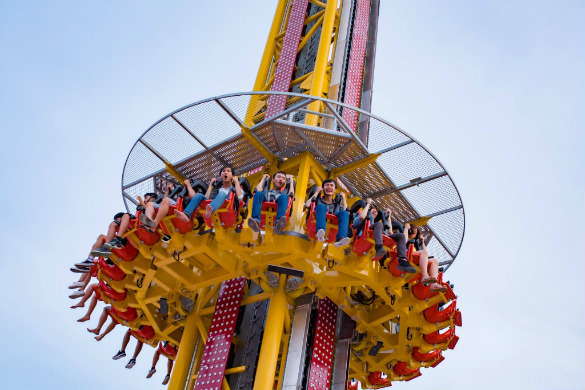 Get your blood pumping with thrilling rides, soak up the views from the Ferris wheel or enjoy a ride on a classic carousel. Learn about the heritage and culture of ten Asian nations, including Japan, South Korea, India and more, in the Cultural Park or spend time exploring the Central Zone and its many attractions, from its impressive Buddha statue and dragon boats to its scenic park monorail. Whether you’re looking for fresh produce, handicrafts, clothing or something in between, Da Nang’s Con Market is the place to head for all your shopping needs. Home to more than 2,000 stalls, the market’s wares are spread across three levels, with fruit, vegetables, meats, spices and fresh flowers found on level one, and clothing, souvenirs and traditional garments scattered across the other two. Embrace the opportunity to sample the local cuisine or pick up all the ingredients needed to cook up your own Vietnamese feast. With so many stalls to browse, you can easily spend a whole morning or afternoon exploring this popular shopping spot. Thinking of setting out on your own Vietnamese adventure? Find unforgettable Southeast Asia tours from Webjet Exclusives today!